Fall Colors? We&apos;ve got them! When most people think of fall foliage, the oranges and reds and yellows of the Northeast and New England come to mind. As a former resident of that part of the country I can&apos;t argue with the beauty of that region in the fall, but after a couple of years here in Cheyenne and the Rockies, I sure can argue that Mother Nature presents an amazing canvass right here along the Front Range. This past weekend I took the time to hike the Headquarters National Recreation Trail in the Medicine Bow National Forest. The trail is located about 35 minutes west of Cheyenne in the Pole Mountain area. 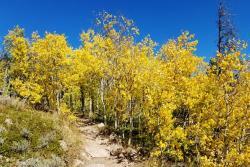 This is the same trail the my 8-year old and I back packed on last June and I was curious as to if the Aspens had started to change colors yet. Boy was I in for a treat. 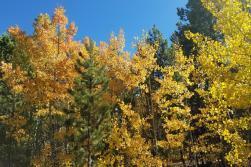 The trail was completely decorated in vibrant yellows, splashed with occasional oranges and reds along the way. It made for an amazing afternoon with my lab Mya and like all hikes at all times of year it provided a sense of accomplishment while getting out and enjoying perfect fall Wyoming weather. I met fellow hikers who were taking advantage of the weather, several mountain bikers and even a trail runner on a Sunday afternoon. The trail is 4 miles each way from trail head to trail head. The easiest trailhead to find is the Summit Trail Head,, which is just down the forest service road behind the I-80 rest area at the summit. The other trailhead is located off of Happy Jack Road, about a mile in on forest road 707. Autumn has always been my favorite season, back in NY or here in Wyoming it provides picture perfect days, great beers and college football. Add colorful hikes and brisk evenings to the list and there is a lot to enjoy. Looking for your own fall foliage experience? 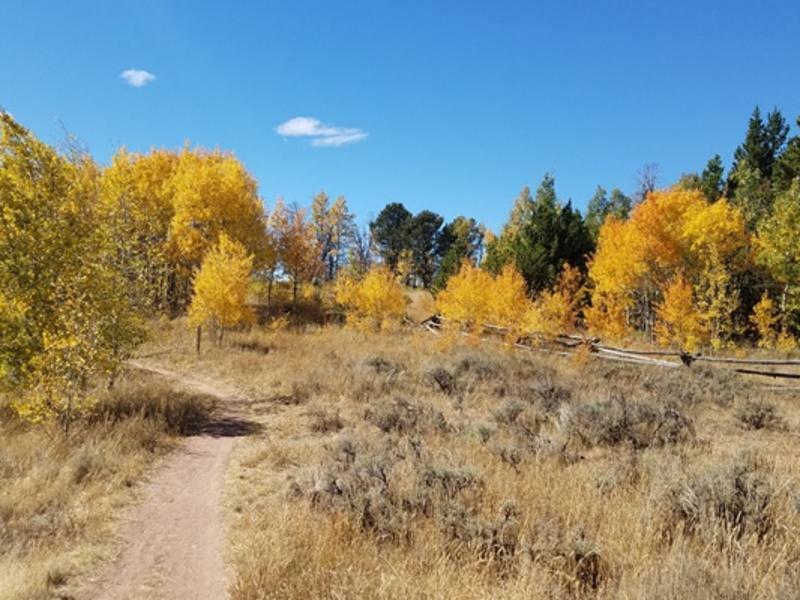 The Cheyenne area offers many places to enjoy the colors from close, in-town parks like Lions Park, or short road trips away in Curt Gowdy State Park, the Vedauwoo and Pole Mountain areas of the Medicine Bow National Forest, or even the arboretum that the city of Cheyenne owns. Take the time, get out and enjoy the fall here in Cheyenne.